When Robert Burns satirically eulogised a flea in a ladies bonnet, he intended it as a play upon the juxtaposition of wealth and disgust, setting the piece in the pews of a church. Years after Burns wrote the poem in 1785, another louse was to have a much wider ranging effect on the wealth of Europe. The pest Phylloxera Vastatrix travelled across from America to wreak havoc in an unprepared Europe, whose unresistant vines were a playground for the voracious parasite from 1863 onwards. Phylloxera was no looker, and Burns can certainly be cited in condemnation of the “ugly creepin blastit wonner”. Exactly how the pest made its way across the Atlantic is a subject of some debate. Some blame the amateur plant trade, with British collectors having run a successful trade in the collection of rare plants since at least the French Revolution. Some reason that the louse may well have arrived in a shipment of plants to collectors in Britain, before making its way South as an exchange took place. Others place the blame at the door of French winegrowers, eager to innovate and secure high-yield vines for use in their own country. Indeed, it may well be that both of these explanations ran simultaneously, as the louse spread slowly at first across Europe. Panic set in as its spread across France quickened and reports from outwith the country sprang up. (For an interesting study of the epidemiological pattern of Phylloxera see I. Stevenson, ‘The diffusion of disaster: the phylloxera outbreak in the département of the Hérault, 1862-1880’, Journal of Historical Geography, vol.6, no.1 (January, 1980), pp.47-63.) Botanists and scientists toured vineyards to try and ascertain what was killing the vines, pondering on disease and blight before identifying the louse. Many ineffective remedies were suggested, including burying a live toad beneath the vines in order to soak up the poison, or having young boys urinate on the rootstock. As these methods predictably failed to deal with the problem, the ‘Phylloxera Plague’ spread. Across the whole of France the total volume of wine produced fell an estimated 72% between 1875 and 1889. In the Southern winemaking departments of France in the Midi, Phylloxera all but destroyed wine production as it spread unabated across the region. In the Hérault, for example, a total planted vineyard area of 220,000HA in 1874 had dropped to 47,000HA in 1883. Small and medium winegrowers were worst hit, with their vulnerability heightened by their size. Potential solutions to the problem were hard to come by. Eventually, the most effective solution came from grafting. Enterprising saviours grafted the roots of resistant American vinestock (vitis lambusca) onto the vulnerable European vine (vitis vinifera) to ensure that the louse would not be able to penetrate the thicker roots. The American vine produced an inferior wine to the European vine, but afforded hardier protection and higher yields. Grafting the two allowed growers to retain the quality of the European vine with the added protection of the American roots. Likewise, Phylloxera was unable to travel through exceptionally sandy soils and stony ground, which spared some areas in France and elsewhere from the ordeal. Chateauneuf-du-Pape is the most famous of these, where the pudding stones (known as galettes) in which the vines are grown prevent the pest travelling. In Burns’ poem, the louse is a social leveller ignorant of airs and graces. 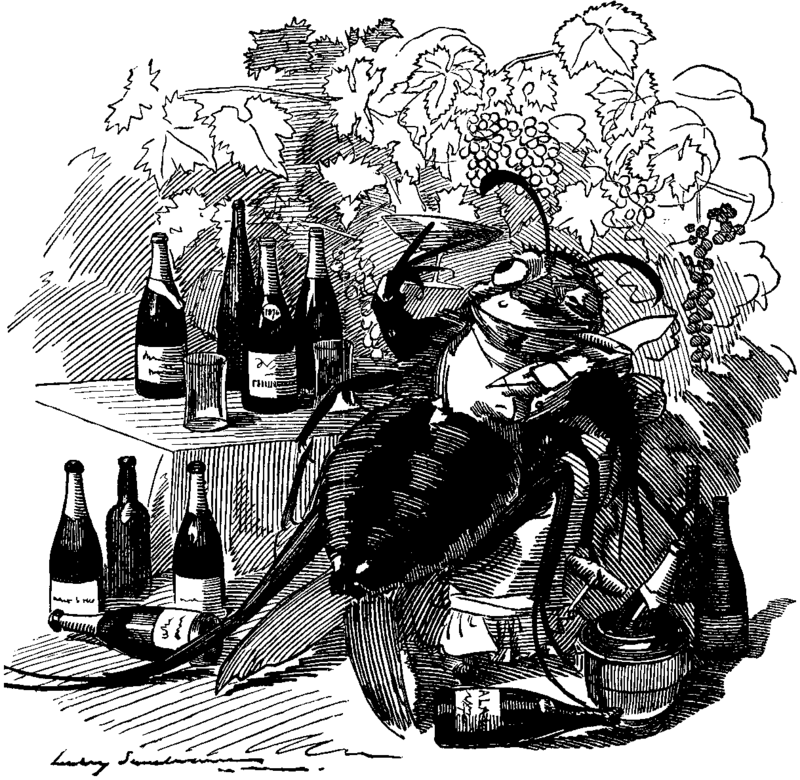 Phylloxera had the same effect – tearing through Europe like a fire and blighting rich and poor alike. A tiny louse challenged a wealthy industry of centuries’ provenance and changed the entire practice of wine-growing in Europe. Yet it also impoverished small land-holders and viticultural labourers, and badly affected the vine dependent Midi. Throughout the period, the villages of the Bas-Languedoc lost some 10-25% of their population as those devastated by Phylloxera moved in search of better fortune elsewhere. Many moved to Algeria, taking up wine-growing there and ultimately competing with the Languedoc. More like a viticultural ‘shock doctrine’, Phylloxera changed wine production markedly. By the time of recovery in 1890, widespread replanting ensured that an abundant crop flooded the market. This created an overheated wine economy in the Midi leading to price drops and the establishment of a chronic cycle of boom and bust vintages. The vine-lands of the Midi were drawn into truly large-scale viticulture, producing low quality, low-cost wine in vast quantities for a fixed market. It was this situation which laid the groundwork for the vast riots of 1907, growing out of labour disturbances in the years prior (and more on that anon). After this replanting, the end of the nineteenth century saw almost a third of the Aude under vine, with some villages having up to 70% of their population working in the vineyards or auxiliary industries. Fluctuating markets, fractured small-holdings and a recent history of catastrophe all marked these Southern departments out for social disturbances in the years to come. The malcontents of this refashioned industry would pose questions that would not satisfactorily answered until arguably the 1980s. Much like Burns’ social leveller, Phylloxera certainly altered European wine production, thereby setting the tone for a century worth of disturbances in the Midi. For Southern winegrowers in particular, this tiny louse did far more than feast on the manor-born. Reblogged this on Dr Andrew W. M. Smith.